Ele Carpenter facilitated the making of the iconic Html Patchwork, a collectively stitched quilt made up of 216 hexadecimal colours. The work was made through workshops in five countries bringing together crafters and coders to discuss their practices whilst stitching. 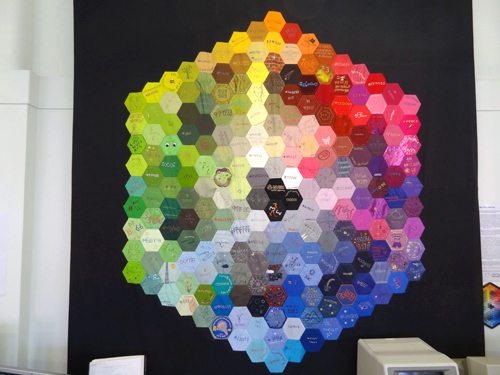 Each hexagon is embroidered with its RGB colour code and is personalised by the sewer. The quilt is permanently on show at the National Museum of Computing at Bletchley Park, UK, home to the Engima code-breaking machine and computers that arose from Jacquard Loom technology.